BK Racing announced Wednesday that it was moving Randy Cox from the crew chief position on its No. 83 Toyota team in the Monster Energy NASCAR Cup Series to the crew chief position on its No. 23 Cup team. Meanwhile, Doug George will replace Cox as crew chief on the No. 83 team. Former No. 23 crew chief Patrick Donahue left the team after Sunday’s Axalta Pocono 400 at Pocono Raceway in Long Pond, Pa. According to a report from Motorsport.com, Donahue was terminated by the team last week, but he insisted he fulfill his “responsibilities with the No. 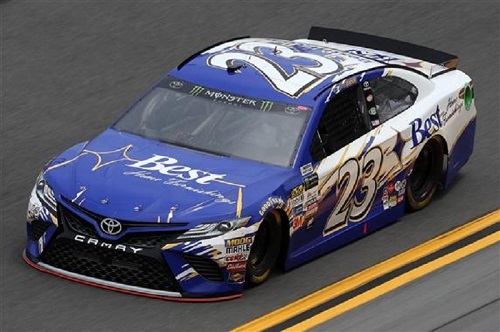 23 team and Gray Gaulding.” As a result, Donahue remained in his crew chief position for the June 11 Axalta Pocono 400 at Pocono Raceway in Long Pond, Pa.
Gaulding also will not be with the No. 23 team for Sunday’s race at Michigan International Speedway. Instead, the No. 23 will be driven by NASCAR Xfinity Series regular Ryan Sieg. There has been no announcement from the team indicating whether the switch from Gaulding to Sieg for the Michigan race is permanent or temporary. Donahue has experience as a crew chief in all three of NASCAR’s national series — Cup, Xfinity and Camping World Truck — and he was with BK Racing for five years.